We have had a lovely day today and spent the afternoon at the park with my sister and the kids. 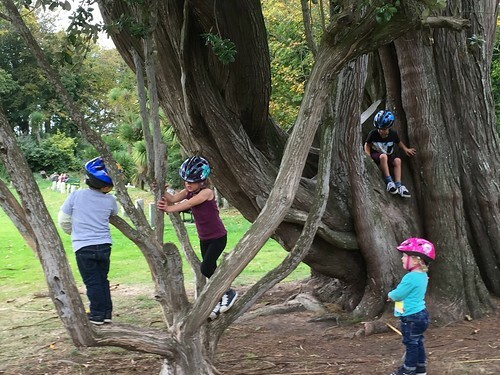 They had a lovely time scooting about and climbing trees. Hard to believe that it is the end of October! 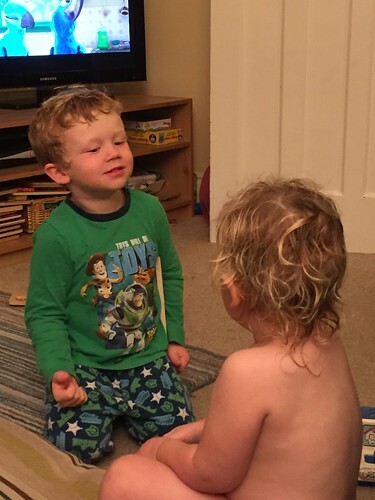 This photo today is The Little Mister demonstrating to his little sister what the ‘poo face’ looks like. I suspect that potty training for her is on the horizon but I am trying not to think about it! I am bored of our evening means. We eat the same thing all the times; chilli, spag bol, curry, shepherd’s pie. Boring, boring, boring. 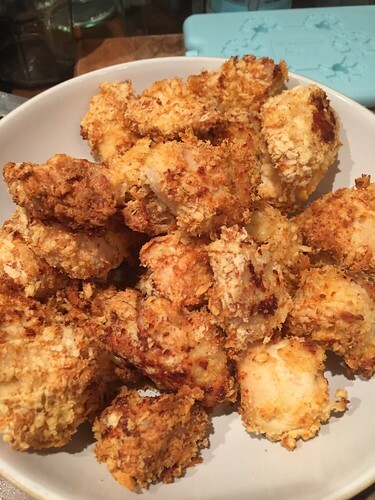 Today I made home-made chicken nuggets. They were yummy and so easy to do! Our childminder was on holiday today so I took the afternoon off and spent a lovely afternoon down at the beach enjoying the October sunshine with some friends. It was such a beautiful day and the boys played together so well. They were digging and collecting rocks and wading in the sea over the top of their wellies. I almost love the beach even better in the Autumn. Whatever the season the island is beautiful. 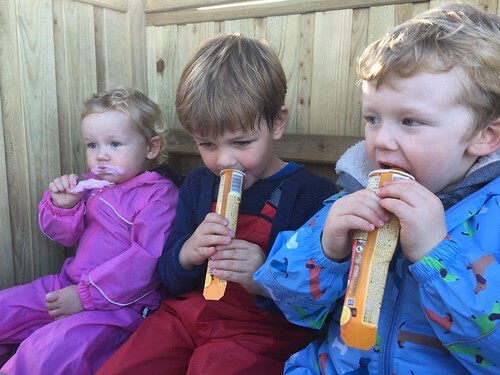 We then stopped at the kiosk so the children could have ice-creams and we could drink coffee. Perfect. No time for a photo of my own today and I haven’t been doing anything interesting anyway! This is a photo that my father-in-law took whilst we were away in York. 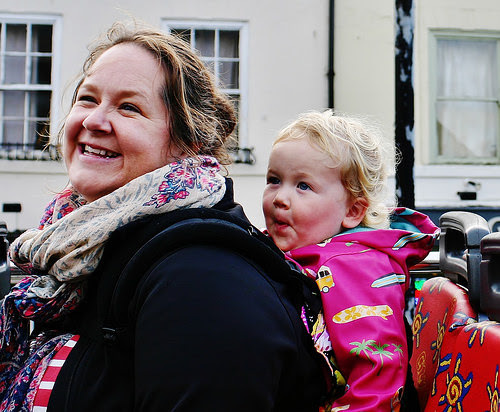 We recently bought a new Toddler Tula sling as the Ergo was getting a bit small. It is brilliant but there is no getting away from it, The Little Miss weighs a ton these days! However, when I need to carry her she is better in a sling than in my arms! She loves being in it, and is so nosy that it means she can get a proper look at everything going on! It would seem that a day without naps results in this. 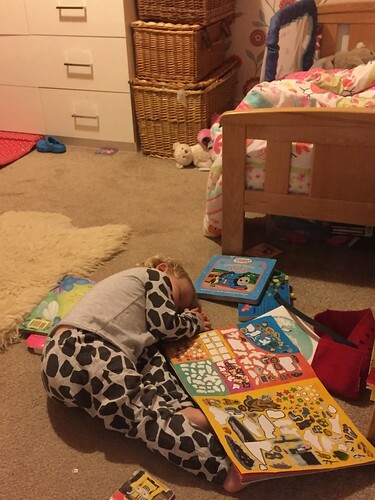 One minute The Little Miss was playing in her bedroom and reading her books as she usually does before she climbs into bed and snuggles down. Tonight she didn’t even make it to bed. It seems that everyone is on the mend so we made the most of the gorgeous, warm (!) 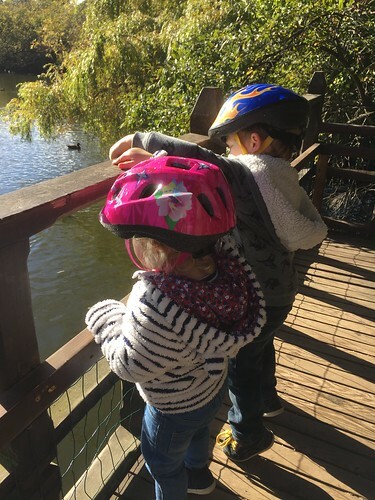 October weather and went to the park where the kids had a scoot about followed by an Autumn ice-cream. Another day of off-colournedness in this house. 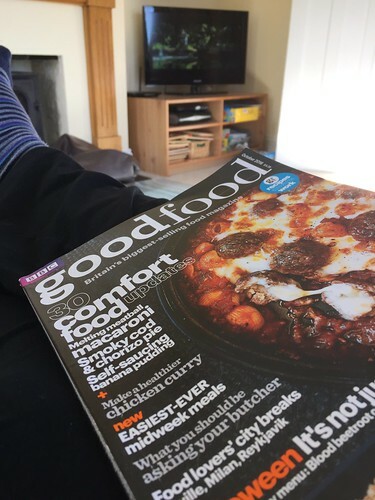 I spent the afternoon curled up with the kids watching The Incredibles and reading magazines. It was very needed. 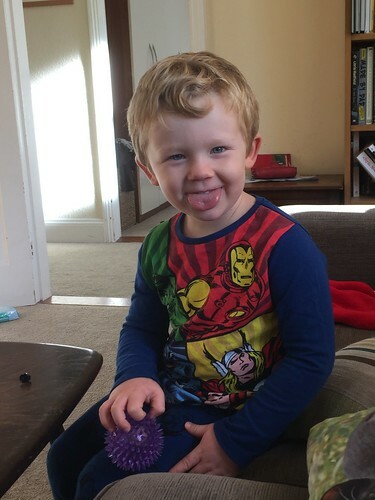 He is so pleased with his new Christmas pyjamas which he ended up having super early. He’s super smart, makes me smile and infuriates me in equal measure. His relationship with his little sister is fab, although they fight like cat and dog at times. It makes me smile to see them holiday hands when they are walking down the road. I just hope that he will grow up to be kind, loving, generous and happy. That’s all I want. 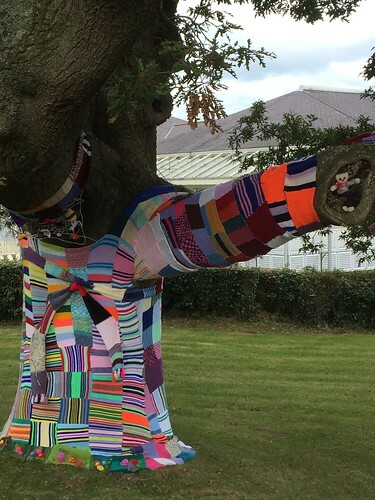 Back to work today and I noticed that one of the trees outside the office is now wearing a nice wooly cardi.